After visiting the Primrose Bakery I felt inspired to make something from their book, which I had got for Christmas but not got around to testing yet. 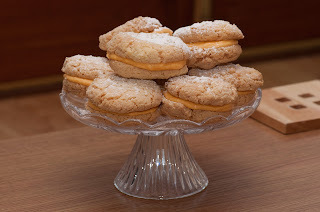 We were feeling a bit cupcake-d out and so I went for the melting moments since I was feeling in a biscuity mood, which is really quite rare for me! The recipe seemed straightforward but I hit trouble when it came to shaping the biscuits. The mixture was too crumbly and dry and kept falling apart when I tried to shape it into balls. I knew it wasn't right but the recipe wasn't very helpful - there was no hint as to what the texture should be or what to do if it wasn't right. I'm sure to experienced bakers it's obvious but to me it isn't always! As part of my 30th birthday celebrations, Mike and I went away for a few days to London. Unfortunately, we must have picked the week with the most rubbish weather, as it pretty much rained the entire time we were there! It didn't deter us though and we had a fab time, visiting some of my old haunts (I lived down there while I was 19 until 21) such as Elephant and Castle, the Comedy Store, and Camden Market, strolling along the river (or more like hurrying along inbetween downpours...), wandering around Harrods and MnM's world (luckily we have photographic evidence otherwise we might have thought we'd accidentally done some drugs), and the part I was most excited about: visiting bakeries! We visited the Primrose Bakery near Covent Garden - 42 Tavistock Street, WC2E 7PB. I immediately loved it; a happy corner of yellow which was very welcoming amongst the grey drizzle! I was glad it was fairly quiet so I could peruse all of the lovely things on display. Cakes Not From Kim: Birthday Cake! Luckily Mike had sorted out a cake for me - he informed us that the only ingredients he used were "a woman and some money" and so we all breathed a sigh of relief! We went for afternoon tea at Peckforton Castle in Cheshire which was beautiful, I had the champagne afternoon tea and had my glass topped up for free! I had never been before and will definitely be going back again, highly recommended to anybody who lives locally or is visiting the area. So you know how behind on blogging you are when you're posting your Easter bakes in June... I'm determined to catch up though, and really want to have everything go on the blog in order, so it will just have to be extremely late! I was determined to do something different this year after making the same Easter cakes 2 years running, and ended up doing 3 different kinds of cupcakes. Firstly, Easter nest cupcakes inspired by the WI Celebration Cupcakes book. This is such a lovely little book, although I have to say I've never tried any of the recipes themselves, it's great for ideas for toppings and decorations. 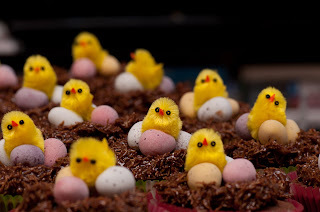 These are just my basic chocolate cupcake recipe, topped with the traditional Easter nest shredded wheat/chocolate/butter/cream/icing sugar etc combo, plus mini eggs and Easter chicks of course. Secondly, I had bought these wafer bunny decorations in Lakeland and so added them to some white chocolate cupcakes. Reese's Cups birthday cake - take 2! The Reese's cups inspired cake got another outing not long after the first attempt - this time for Nic's Notebook's birthday in March. We went out to Tom at 101 for a meal and I was very excited/nervous to be asked to provide a cake! Luckily I knew straightaway that I would make the Reese's cake again, since Nic had liked the sound of it when I had mentioned it in February. It was exactly the same cake as the first, the only difference being a daisy and a few butterflies... and a mahoosive sparkler provided by the restaurant when they brought it out! 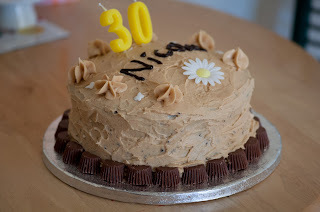 Without doubt the hardest part of cake making to me is the decoration, and this time I had the bright idea of tracing out the name in the buttercream before piping it in. Can't believe I've never thought of this before, definitely going to be doing it like that from now on!